To order a printed copy of the ABC Boating Holidays brochure, simply click the Request button below. UK Boat Hire will introduce you to one of Britain's best kept secrets, the 2000 mile network of waterways and navigations, for which the canal boat was specially designed, that meander across some of the most beautiful countryside, and past pubs, cottages and warehouses. Here you will discover the Britain most tourists miss on their holidays. Most visitors appreciate the independence, the peace and tranquillity of 'getting away from it all'. You can choose between the challenge of some of the densely locked stretches of canal – quite astounding feats of engineering – or choose lazy days drifting along the many stretches with very few locks. The canals and rivers go through the heart of the cities as well as through open countryside, and your boat can be a mobile base for exploring the history of our great trading routes, or for the diverse entertainment you will find in our largest city centres. UK Boat Hire offers 14 start locations to explore the two thousand miles of tranquil waterways, threading their way through some of Britain's most beautiful and unspoiled countryside, offering a haven for wildlife and an insight into our industrial heritage. A network of waterways taking you to the heart of major cities, with all the entertainment and leisure facilities that they provide. ABC Boating Holidays Brochure Martin B. said: Did find useful and will be arranging hire for the summer. ABC Boating Holidays Brochure Gideon G. said: useful for first timer! ABC Boating Holidays Brochure Trevor B. said: The nearest cruises are from Cheshire, which was disappointing, as I had hoped nfor something local. ABC Boating Holidays Brochure Andrew B. said: all very good very informative. ABC Boating Holidays Brochure Kate C. said: Clear layout pictures off each type of boat is helpful for planning a booking. ABC Boating Holidays Brochure Gordon T. said: I found the brochure very informative and the boats on offer brilliant but we are going to wait untill the nhs has sorted out our holiday times? ABC Boating Holidays Brochure Maurice B. said: good service. ABC Boating Holidays Brochure Carlie S. said: Amazing ideas for an alternative family holiday. Informative and interesting, especially the information on the Scottish canal network and the incredible Falkirk wheel. Clear and easy to understand tarriffs. ABC Boating Holidays Brochure Margaret G. said: It was very informative. 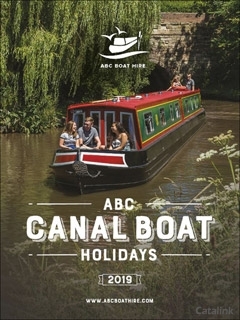 ABC Boating Holidays Brochure Harry T. said: family members have been talking about a canal holiday recently, hoping this will start the ball rolling. very good well laid out brochure. ABC Boating Holidays Brochure Chantal O. said: Fantastic brochure. Cant wait to book our first family boat holiday once we can afford it. ABC Boating Holidays Brochure Allan M. said: We found exactly what we were looking for & will hopefully be booking soon. ABC Boating Holidays Brochure Peter B. said: Fast delivery. Not really got the packages I was looking for. ABC Boating Holidays Brochure David John T. said: Great detail of what you can hire and where you can go the time it takes and the passes licences needed and contact details required . ABC Boating Holidays Brochure Linda B. said: Interesting holidays may be something we would like to do. ABC Boating Holidays Brochure Keith D. said: Price of holidays a little steep. ABC Boating Holidays Brochure John A. said: The brochure is well laid out and very easy to understand, also the pictures are very colorfull and helpfull. ABC Boating Holidays Brochure Karen W. said: interesting brochure. ABC Boating Holidays Brochure Mervyn H. said: Looks likegood value for money, especially when one remembers the price is per boat, not per person. <i>Malta Direct</i> make booking your ideal holiday easy. Their destination knowledge, affordable prices and flexibility has customers come back time after time. Take the plunge on your next trip away and experience the height of paradise. Order your <i>Malta Direct</i> brochure now! New to cruises? Or cant decide which one to go on next? This brochure is for you. Titan have over 140 extraordinary voyages for you to sift through. River, ocean, family or luxury cruising &#8211; find them all here. By pressing the Request Printed Brochure button you give consent to ABC Boating Holidays (and their Data Processors for the specific purpose of delivering your literature) to send you their Brochure .